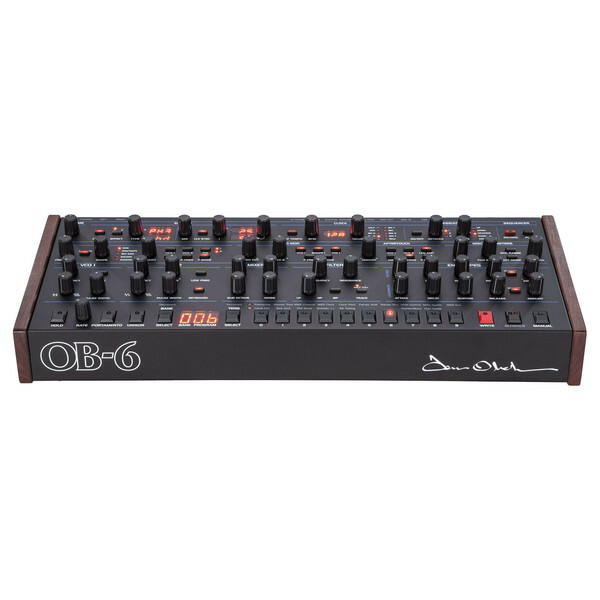 The Dave Smith Instruments OB-6 Module is a desktop analog polysynth featuring 2 oscillators and a 64-step polyphonic step sequencer. This unique analog synthesizer is a collaberation by two of the most influential poly synth designers in the world, Tom Oberheim and Dave Smith. The OB-6 provides the perfect balance between Oberheims signature sound and modern innovations. This desktop version of the OB-6 is highly-portable and perfect for both studio and live performance applications. This desktop module version of the OB-6 is designed to offer maximum portability whilst ensuring all the components and features from the original OB-6 are included. The interior workings of the OB-6 Module are exactly the same as the keyboard version, with all the parameters, sounds and switches featured in the ergonomic layout. One of the most unique features of the OB-6 Module is the ability to ply chain two OB-6s allowing ytou to pair them for twelve-voice polyphony. Its lightweight and portable design makes it small enough to fit into a backpack, perfect for the travelling musician. The only thing that has changed is the exterior design, making the OB-6 Module just as powerful as its related models. The OB-6 is the result of two of the greatest minds in synthesizer design coming together. Dave Smith and Tom Oberheim are revered for their innovative and influential poly synth designs, with each bringing their own unique qualities to the OB-6 Module's design. 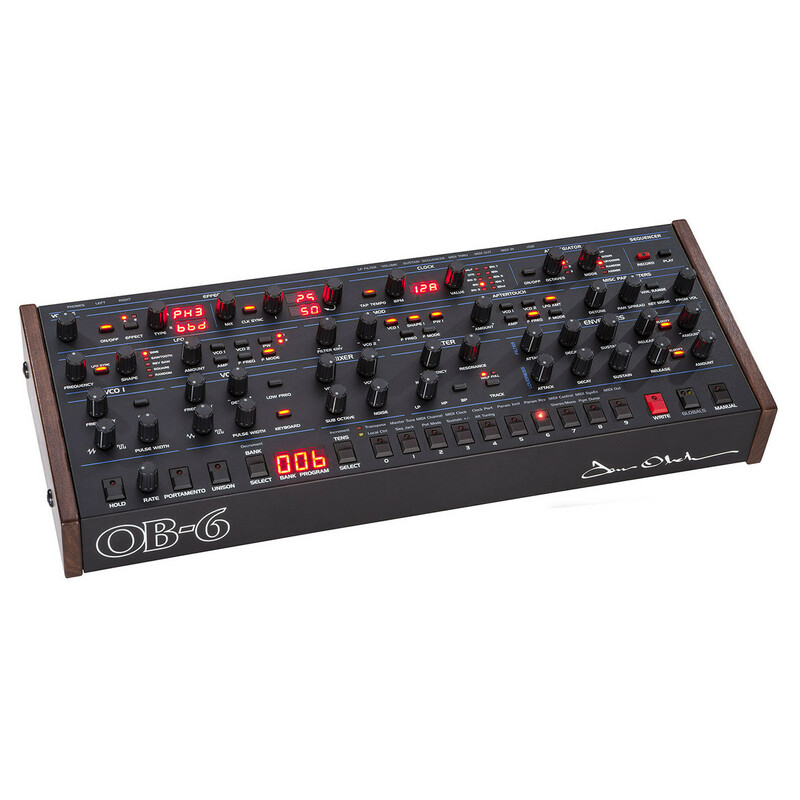 The OB-6 Module combines the bold, signature sound of Oberheim with Dave Smith's modern innovations, resulting in a portable poly synth module that provides the best of vintage synthesizers and modern technology. The sound engine in the OB-6 Module was developed and inspired by Tom Oberheim's original SEM, which served as the keystone of his 4-note and 8-note synths. The sound engine features two discrete voltage-controlled oscillators (and sub-oscillator) per voice, plus continuously variable waveshapes. The 2-pole, state-variable resonant filter provides a range of parameters including low-pass, high-pass, notch and band-pass functionality. There is also a range of varied effects built-in to the synth, allowing you to tweak and edit your sounds as you play. Providing studio quality effects such as: Delay, Reverb, Chorus, Flangers, Phase Shifter and Ring Modulation. These digital effects run at 24-bit/48kHz resolution with a true bypass that ensures the full analog signal path. The X-Mod function (Crossmodulation) allows you to modulate the frequency of two oscillators, expanding your tonal palette and creating the means to build unconventional and unique sounds. The modulation sources are the filter envelope and oscillator 2, with both featuring bio-polar controls. You can then choose from a range of destination including Oscillator 1 freq, Oscillator 1 pulse width, filter cutoff, shape and more. In addition to the crossmodulation, the OB-6 features a polyphonic step sequencer which supports up to 64 steps and up to 6 notes per step. This versatile sequencer allows you to arrange and create sequences and synth to an external MIDI clock. The unison mode in the sequencer features a configurable voice count, key modes and more.